Celebrity cats, we imagine, probably get tired of all the fanfare. But we are absolutely certain that Grumpy Cat is so over it. She’s pretty much grumpy all of the time, but that’s why we love her. So when Friskies gave us the opportunity to Skype with the Internet famous feline, whose real name is Tardar Sauce, there was one question we had to ask: is there anything that makes her smile? 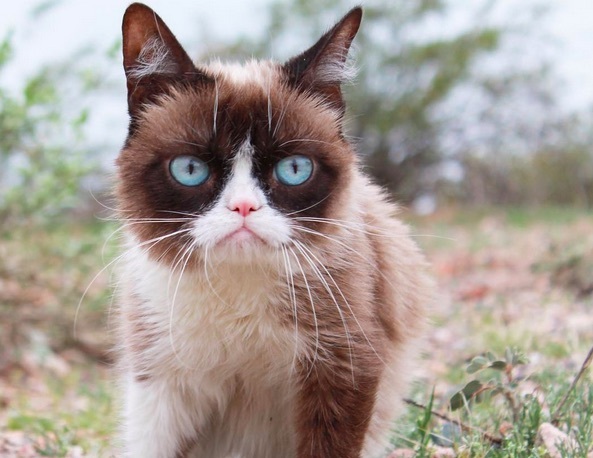 Grumpy became famous on Reddit in 2012 for her ill-tempered look and went viral after one of her owners posted a video to YouTube to prove that the kitty’s natural scowl was in no way Photoshopped. She was immediately rocketed into stardom, traveling all over the world, getting her own movie (starring Aubrey Plaza) and becoming the spokescat for Friskies. Her success just keeps growing, and she’s a role model to so many young female kittens who aspire to her greatness. “You can’t be a celebrity without haters,” she warns. But she does have some tried-and-true advice: surround yourself with other cats and, of course, eat Friskies. Grumpy’s current project as spokescat is all about Friskies’ new Cat Concoctions, which involve crazy flavors like Cod in Cheesy Bacon Flavored Sauce and Lamb in Clam Flavored Sauce, her favorite. We can all get involved in the launch by participating in the conversation over on the #CatConcoctions hashtag, and, of course, pampering our own kittens so they can grow up to be just like Grumpy . . . except maybe a little less grumpy.